GBPJPY heads higher towards key resistance level as it retain its short term uptrend. On the downside, support comes in at the 147.50 level where a violation will aim at the 147.00 level. A break below here will target the 146.50 level followed by the 146.00 level. 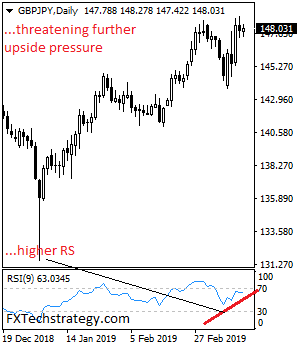 Conversely, resistance is seen at the 148.50 level followed by the 149.00 level. A cut through that level will set the stage for a move further higher towards the 149.50 level. Further out, resistance resides at the 150.00 level. Its daily RSI bullish and pointing higher suggesting further strength. All in all, GBPJPY looks to strengthen further lower.